I'm taking ONE commissioner right now! 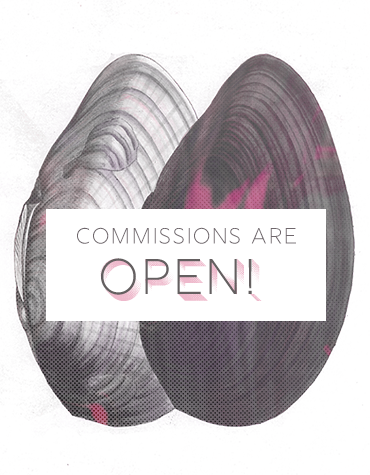 I can make either Dreamwidth or Tumblr layout commissions! I'm a web designer and developer by trade, so you know you're getting some good codes right here, folks. Read on below for more info. It will be responsive (meaning, when you look at it on a phone it will respond to the screensize and look nice and be functional). $5 per basic inline codes like a taken list. If you get one along with a layout, price will drop to $3. $10 per navigation graphic, profile graphic, muse list, et cetera. If you get one along with a layout, price will drop to $7 per item. I reserve the right to ask for more if what you want is more complicated than average, but that would be rare. Most of these items won't be responsive and will be coded for a default DW styled page. See under the cut for a few examples! If you want anything extra fancy, like a masonry layout, nice animations or transitions, or basically anything that requires extra jquery or advanced CSS it will cost more. The extra cost will be determined depending on what is wanted. EXAMPLES: A commissioned layout and a WIP layout, so it's not finished / polished but is finished enough to give you a good idea of what the final product will be nonetheless! If you have any questions, feel free to comment here or e-mail me. I will ask you what you're looking for and once we got details figured out I will send you a Paypal invoice. I can only take Paypal! I will mock-up a design in PS to show you before I code, you will get 2 free revisions. Once approved, I will begin coding! Please give me 2 weeks to get your layout done. I will give all commissioners regular updates on status. :) You're welcome to e-mail me if you have any questions in the meantime. If you have plurk and want to be notified when I have open slots again, let me know your username! My commissions/replurkable account is @betterdolphin. Feel free to follow it. 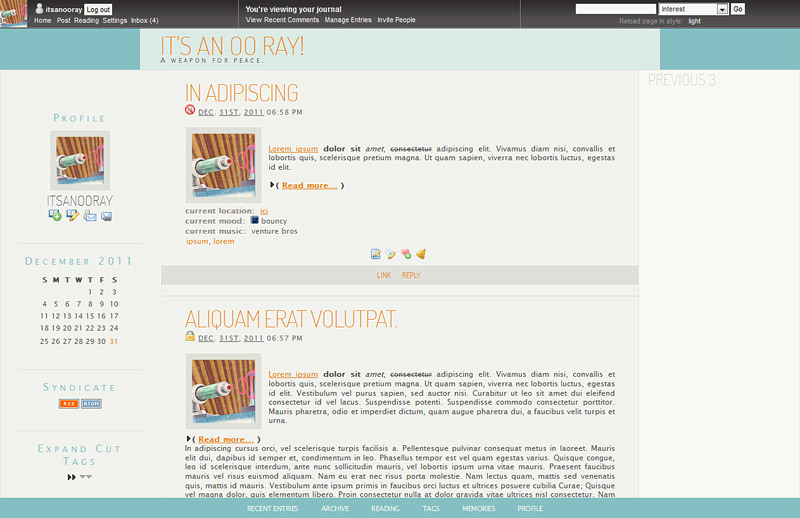 A custom theme for "Trifecta" template. This is a minimal, elegant, white and responsive theme. It's available on Gumroad to download for free or you can tip/pay what you want for it! It will ask for your email but it's just to email you a receipt/back up link, you aren't added to a list. → You may edit the layout to suit your needs or tastes, however, you are not allowed to redistribute, share or resell. I recently switched hosts and basically took down all folders in effort to revamp, but forgot I would need to leave a certain folder up for stuff on this comm to work. Silly me. I'm putting everything back up now, but if anything seems missing or downloads not working, please drop me a line. 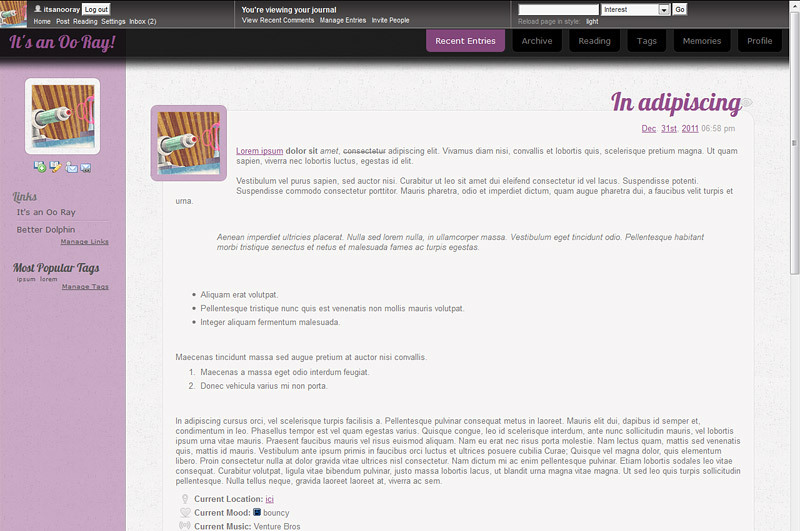 Has many color variations and features a fixed side menu. EDIT Did a quick fix for an issue on Chrome, so if you happened to grab it in the past half hour please grab again. Also added a 6th variant. EDIT There was an issue with the profile userpic being distorted on phones/some browsers, I have fixed it, so please grab again if you want! - You may edit to suit your needs, but credit would still be nice. - Commenting not necessary, but makes me feel good all over anyway if you do. Has many variations. 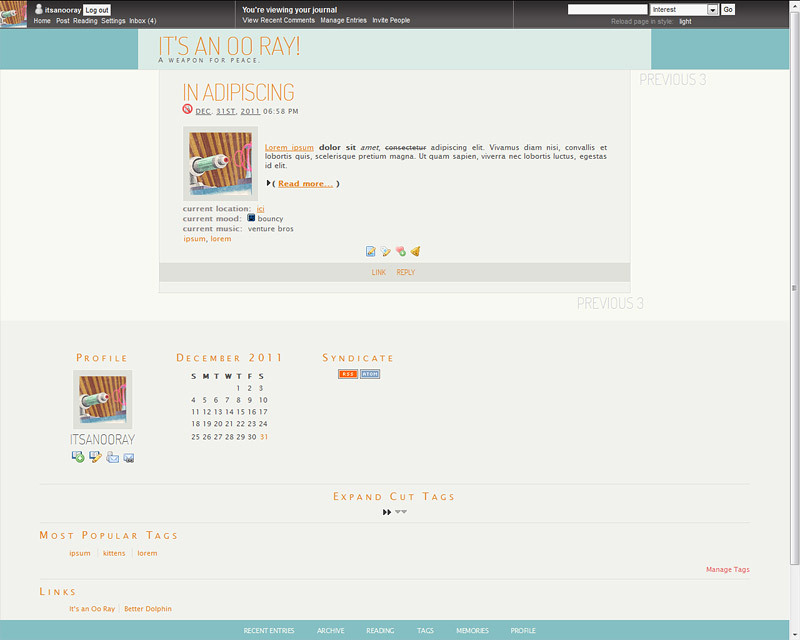 One with a sidebar, one with a bottom bar, all with 4 pre-made color variations. Note still figuring out DW layouts, feel free to tell me if I got anything wrong. UPDATE 1-4-12: There was an issue where the "powered by" was showing up at the top, I have hidden that module. Also a couple tweeks were added that don't really affect anything, they were added for "just in case" purposes. And sometime in the future I may try to make the layout work for comments, but I'm not sure when that will be, but feel free to check back from time to time or watch this comm, as I'll make a post about it when I do! Has many variations. There's a textured version with 4 colors, there's also a no texture version with just one color but that's because you can change colors on your own, and then both have a stickied sidebar and non-sticky sidebar option. Note this is my first time making a layout for Dreamwidth, there's bound to be something I missed. Feel free to inform me in comments. This community is for sharing layouts and other bits of code for use on Dreamwidth. So, please, if you like something here, feel free to take and use! 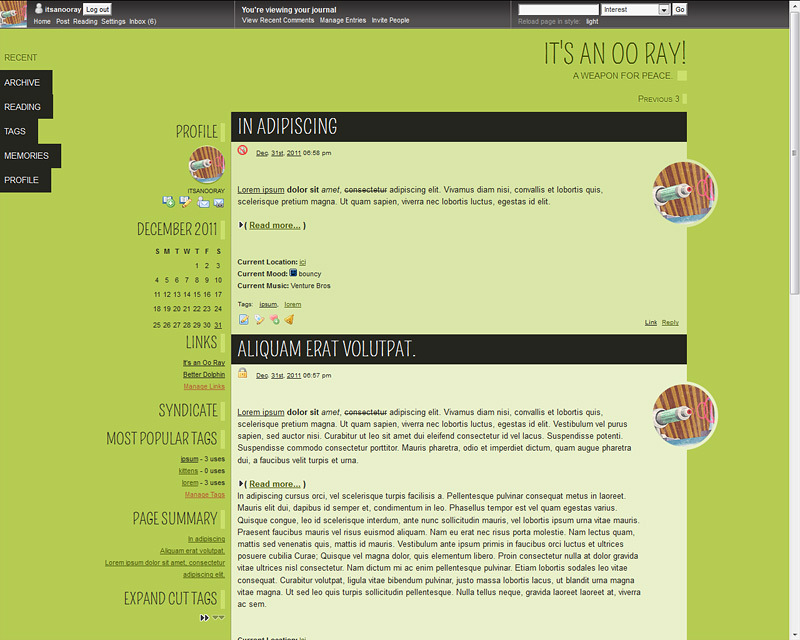 Layout made by <user name="betterdolphin">. Layout made by <a href="http://betterdolphin.dreamwidth.org/">Better Dolphin</a>. Please host images on your own servers, or, if you lack that, use IMGUR or any other host of your choice. If you use Photobucket, please keep in mind it will resize large images once in awhile, so if you uploaded one of my images and it came out small check your options and see if you can upload something at fullsize, or use another image host. Q) Can I edit/change your layouts? Yes, you can! I highly encourage you to. However, if the resulting layout still looks like my original one, you must still credit. Q) Can you change this in your layout for me? No. If there's something in my layout that you want to be different than I intended it, you must change it on your own. I know not everyone knows CSS, but it's not fair to ask a layout maker how to change something they didn't intend for their layout. I'm afraid I don't have the time to help make large changes that you may want. However, if you found something that seems like it's broken code, let me know and I'll most likely fix it. Q) Can images be added to the headers? A) I rarely make a layout with the thought of a large image being added to the header, if I had intended to make something like that it would have it in the codes. That doesn't mean you can't try to add one anyway, but don't be surprised if it doesn't work/you have to edit a bunch of CSS to get it to work. Like the previous question, however, I don't have the time to help you change something as massive as that. Q) Can I redistribute your codes with my edits? A) I don't mind if you edit my codes, but if they still bear a strong semblance/a good majority of my original code I would prefer you NOT to redistribute it, please, even if you do credit me as the original maker.